I'm sure watching the news, listening to it on the drive to and from work and/or reading it in the newspaper has benefited me in more ways than I can imagine. Today, however, it just ticked me off (to put it nicely). One thing that I can't stand though is hearing about things that, like autism, seem to be cyclical. April =Autism Awareness Month=BIG field day for news people. They seem to report (more often than not around that time) about the latest and greatest "miracle cure" for or "breakthrough found for the cause" of autism during that miraculous month. Now wouldn't you think I'd be THRILLED beyond words if any of those reports were the slightest bit true? I mean come on! But alas it's just never true and I tend to take it with a grain of salt. I, like most people, find the recent rise in the instances of children diagnosed with ASD (Autism Spectrum Disorder) astounding and it takes my breath away each time I hear the odds get slimmer and slimmer. 1 in every 110 births results in a child being somewhere on the autism spectrum. (And it's 1 in every 70 boys!!) I don't know about you but after living with autism as an extended member of our family of five for the past 20 years it simply makes my heart hurt when I hear those odds. Shoot! I guess I had better odds at having an autistic child than winning that $335 Mega Million the other night!!! I've spent MANY hours in the wee hours laying in my bed trying to fall asleep while wondering what I did to make this happen. I mean come on.....I'm the mom! Moms are supposed to be the all knowing....in charge...smart ones right?? I carried each of them within me, close to my heart, for nine months keeping them protected, talking to them and anxiously waiting to see their sweet faces. I did what I was told to do by my doctors (ok...truth be told I didn't drink milk because I hate it.... There....now everyone knows the truth on that score) I didn't drink alcohol....have never smoked....never done drugs.... So what did I do? No matter how many times I asked the question Mike (and MY parents) said, "You didn't do ANYTHING wrong". Well....20 years later I still lay awake and wonder so I guess that's just the way it goes. P.S. Moms worry too. Then there have been YEARS....yes, YEARS of reports and debates about a link between immunizations and autism. That's where the media comes in today and is actually what started the rant in my head all day today. I am sickened by the doctors and lawyers who, because of their LOVE OF MONEY, decided to alter results of research that was supposed to "help". Is there a link? I don't know. I will, however, tell you my opinion and that's the best that I can do. I had no clue what had happened and so when Lindsay came along 2 years later I had her immunized too....right on schedule. That's a mom's duty, right? Although she never had the seizures, she changed after the age of 1 and at the age of 2 was diagnosed with autism. I remember going to the pediatrician with Zach when he was ready for his 1 year shots and asking them about the safety issues etc. and they assured me it was completely safe. Only later did I find out about all the horrid things that were actually included in them. Mercury and Formaldehyde were just two of the top items that turned my stomach. I later found out that parents whose children had had adverse reactions to the shots could, and did report the "batch number" back to the pediatricians' offices. Do you know what happens when the doctors return those batches back to the pharmaceutical companies? It is apparently "too expensive" to destroy them so they companies repackage them and distribute them to other pediatrician's offices. Kinda makes you sick, doesn't it??? You've been taught to trust the medical professionals, right? Me too. Not anymore though. So.....I can't tell you have any clue what the cause for autism is......I can't tell you that there's a cure on the horizon for autism.......but I can tell you that no matter what the skeptics say (including a close family member who shall remain nameless...but she IS my mother-in-law) I have loved my children with my entire being....I have held them......read to them.....kissed them....taught them and I treasure them with everything within me. Being told that I'm the reason they are the way they are.... well there are no words for that. (ok, so she called me a bad mother) Well I'll take that as a compliment because my children have touched so many people's lives and I can't imagine being any prouder of them. I know beyond a shadow of a doubt that God holds them quite proudly in the palm of His hand and He is incredibly proud to be their Heavenly Father. We dedicated all three of our kids to Him and we know that He is in control. Autism is NOT A FAD. Whatever the cause......Wherever that ugly beast came from..... It needs to be stopped and destroyed.....never having to be a diagnosis uttered by another doctor or medical professional to unsuspecting, loving parents EVER AGAIN. Please pray for the REAL warriors who are out there....tirelessly searching and fighting for a cure for our children. After reading this I was silent for at least 10 minutes. My heart was breaking. My tears were flowing. 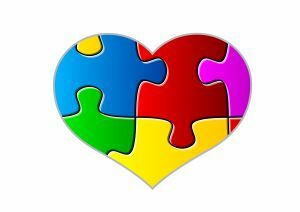 There are no words that can even come close to express how my heart feels right now for you... for all the parents out there that must live and deal daily with Autism. But reading all your FB posts and viewing all the FB photos of Lindsay and Zach and your family since befriending you I do know this: You and Mike are amazing parents who give your all to ensure that the quality of life for Lindsay and Zach is no less than what God designed and planned for them or any other child when He created and breathed the breath of life into them!!! I do pray that this ugly beast called Autism is stopped and destroyed for good! And I also pray that God will continue to pour out His love, peace, mercy and grace in abundance to you and Mike as you express not only your love but God's love to them through you.